To compliment my video kit I still needed a good backpack or shoulder bag that would fit the camera, and not be too massive. Today I finally stumbled upon the bag I was looking for. The problem is that the Sony Z5e is way to big to fit in a normal camera bag. It's higher and longer than most dSLR configurations. But if you want a good video bag, you normally end up in Kata and Portabrace territory. These brands make professional grade bags, which are.. uh. professional in size as well. The Thinktank Streetwalker Pro is a very new bag. It is designed for use in urban and crowded environments, this slim, lightweight backpack. The backpack is sized as an international travel carry-on. It will hold up to a Pro-size DSLR with a 400 2.8 attached. Internal Dimensions: 24w x 42h x 18d cm. External Dimensions: 25w x 45h x 19d cm. I noticed its size immediately in the shop. Its fairly thin, but takes a lot of gear. Having brought the videocamera along, it quickly became apparent that it's an excellent fit. And even leaving room for the video light and other bits and pieces. It has lots of small compartments, and the compact size of the bag makes it very easy to carry. The camera fits in without having to squeeze it in (like i had to on my National Geographic bag). There's also a special flap to put tripod legs in, and extra cords to tighten the tripod to the bag. At first I had dismissed the option of carrying the tripod on the bag, as it is very heavy. But so far, the bag seems to hold firm. I don't think I'd recommend this bag for photo use, unless you carry very long lenses. 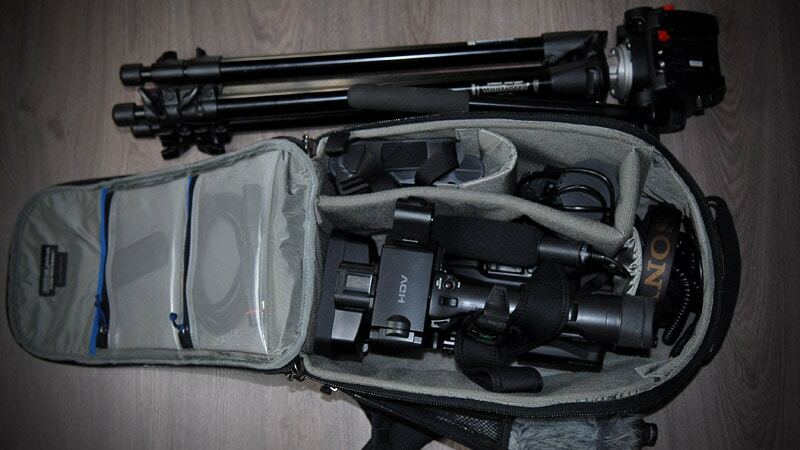 For your dSLR there's loads of different bags and configurations, matching whatever style you have. If however you're looking for somewhere to put a medium sized HD videocamera, this is the bag to go for.